The Dalai Lama is the spiritual leader of the world’s Tibetan Buddhists. As you know from listening to Richard Gere or watching The Golden Child (or reading a book, I don’t know), when a Dalai Lama dies he is re-incarnated. At that point, top Buddhists rampage around the maternity wards of the world and perform scientific experiments (I imagine) to determine which sprog is the bona fide authentic reborn Dalai Lama. Unfortunately, the present Dalai Lama is not playing along. Basically, the current Dalai Lama is in a huff with China for a bunch of stuff including China’s refusal to recognise the man he appointed as his Vice-Lama (technically known as the “Panchen Lama”). 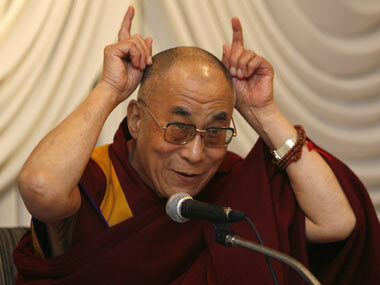 In retaliation, the Dalai Lama keeps threatening to not be reborn. Read that again, please: the Dalai Lama is threatening to circumvent the laws of the Cosmos and not be reborn. Honestly, you could not write this stuff: atheist China demands the Dalai Lama is reborn; Dalai Lama threatens to circumvent the cosmically ordained law; the faithful become ever more faithful as religion becomes ever more absurd; the rest of us suffer the fallout of religiously inspired madness. Oh well, at least it keeps satirists in business.